Within the Text chunk for a longform, you can add an Inline Element. An Inline Element can be a Video, Image, or Pullquote chunk. The Inline element is useful for a Longform, as the element may be within the text. The Inline Element is not full-width and may be pulled to the left or right of the text. 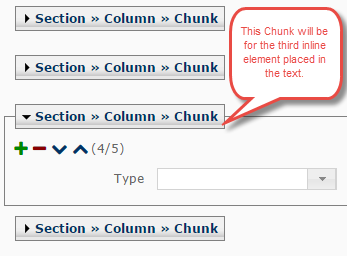 Expand to Section >> Column >> Chunk. 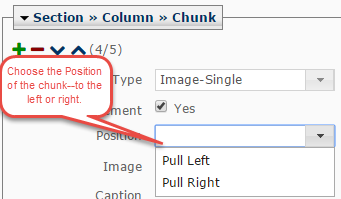 Enter the Chunk Header and select the Header Level. Check the box if you want text to be justified. To add an Inline Element, create a space in the content field where you want your inline element to display. Type placeholder text for your inline element. This text will serve as the "link" to the inline element. At the bottom left-hand corner of the Content field, click the p in Path: p. This highlights the placeholder text. From the Styles dropdown menu, select inline-element. A rectangular box should surround the placeholder text. Add your inline element as a new chunk after the text chunk. These chunks must be in the same section. Click the green [+] to add chunks. For multiple inline elements in a text chunk, add a chunk for each inline element in order of appearance within the text. In this example, the inline element is the third inline element within the text. It will be the third chunk following the main Text chunk. From the Type dropdown menu, select the type of chunk you want for your inline element. Check the Inline Element box. Choose the position of the chunk to Pull Left or Pull Right. Selecting Pull Left moves the Inline Element to the left side of the text. Selecting Pull Right moves the Inline Element to the right side of the text. Complete the chunk fields. Add chunks until all inline elements have been linked. To preview the page, click Submit. Publish the page to view it on the web.